I had previously picked up some macaron baking tips from Jen and I actually managed to bake some pretty successful macarons. So I’m very certain that these cookies would be just as delicious as the macarons! Instead of Earl Grey, I chose to use Green Tea instead as that’s my friend’s favorite tea flavour. 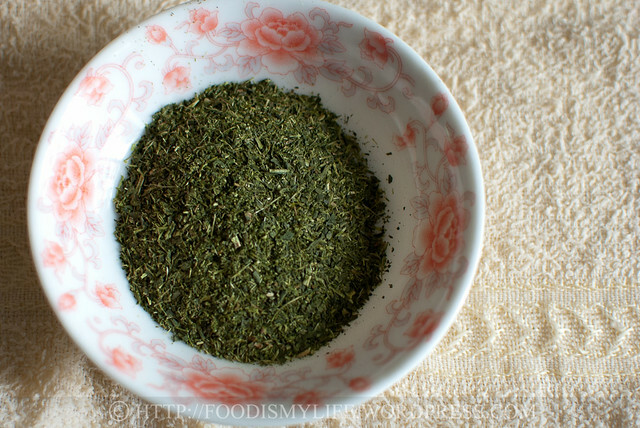 I used green tea leaves instead of matcha powder as that’s the only thing I have on hand. Green tea is a type of tea where its tea leaves undergo minimum oxidation during processing. There are two broad types of green tea – Chinese and Japanese, and each type has many variations of green tea, depending on their growth conditions. Chinese green tea generally comes in the form of tea leaves, while Japanese tea comes in the form of either tea leaves or a fine powder, and this powder is known as matcha. Matcha is a type of Japanese green tea that is grind into a fine powder during processing. They tend to have a more intense flavour than their tea leaves counterpart and its bright green colour often serves aa a natural food colouring. A good quality matcha is very, very expensive! 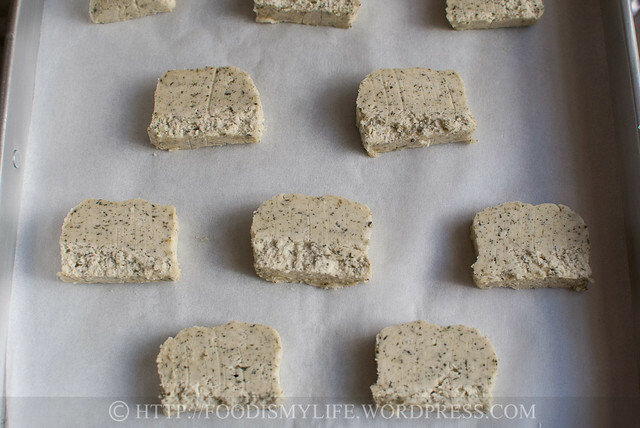 Coming back to the cookies – the green tea leaves I used are of a Japanese variety. They gave the cookies a very light greenish tint and decorated the cookies beautifully (though my friend initially guessed that they were seaweed cookies before she tasted them…). However, despite the cookies being buttery, soft, crumbly and melt-in-your-mouth, the green tea taste was not very pronounced in the cookies. 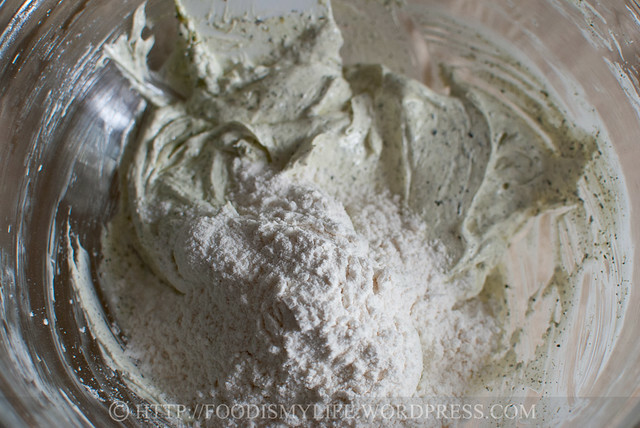 Matcha powder might have worked better – I’m not 100% sure about that – but matcha powder will turn the cookies green… I’m considering increasing the the amount of green tea leaves used or use a combination of matcha powder and green tea leaves the next time. 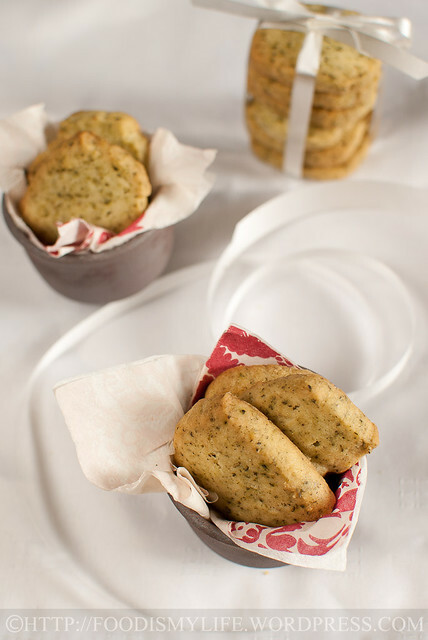 Nevertheless, these cookies are small, dainty, delicious, good for give-away and perfect with a cup of tea! 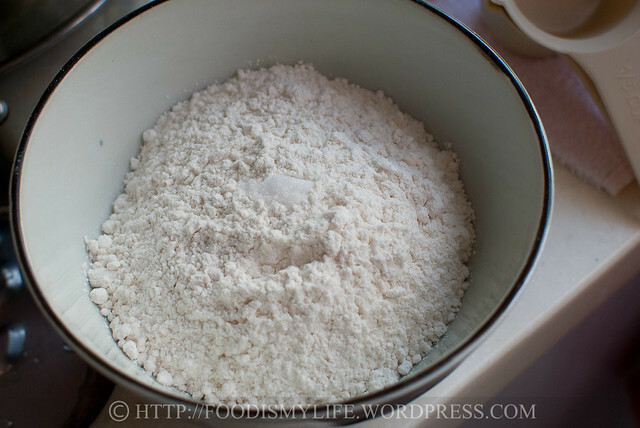 Start off by first measuring the flour ad salt in a small bowl. Whisk together until fully they are mixed thoroughly. 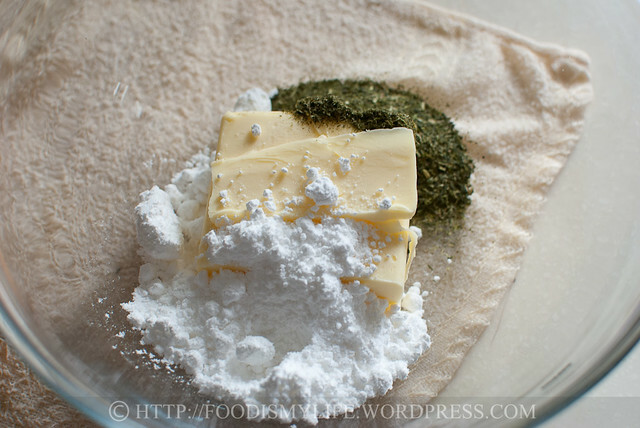 Measure some butter, icing sugar and green tea in a mixing bowl. 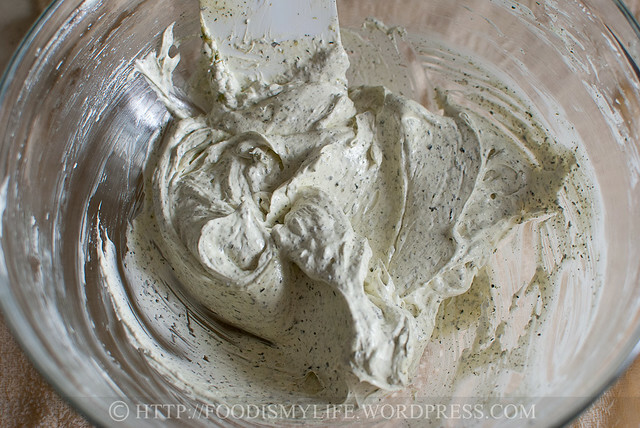 Cream with an electric mixer until pale in colour, light and fluffy! This will take about 3-5 minutes. 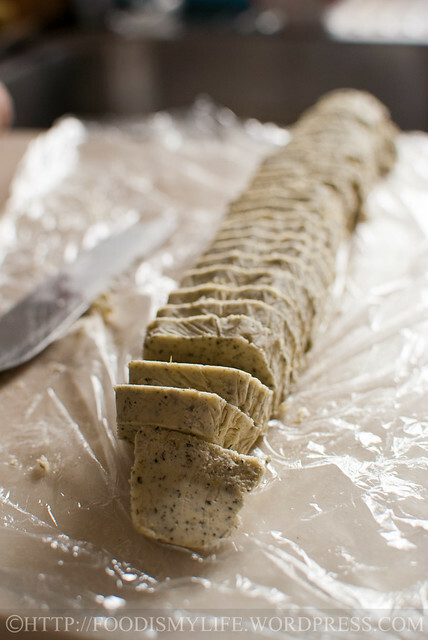 Fast-forward and skipping several photos – roll the dough into a log, wrap with plastic wrap and freeze until firm. Slice them into thick slices! 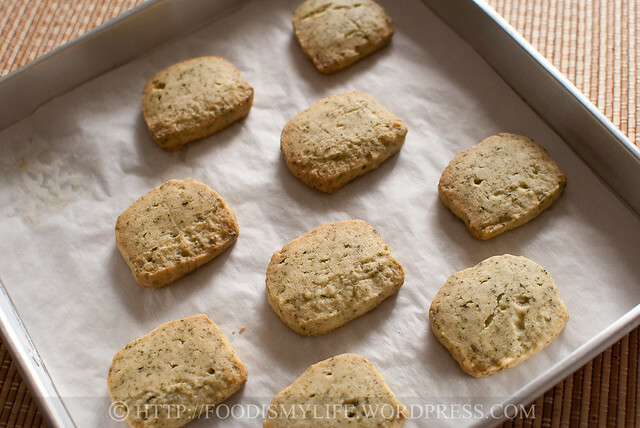 Arrange them on baking sheets and bake away! Golden brown at the edges is what we’re looking for – let cool and serve! Whisk together flour and salt in a small bowl. Set aside. Using an electric mixer, beat together butter, confectioners’ sugar, and green tea leaves on medium speed until pale and fluffy (about 3-5 minutes), scrapping the sides down several times with a rubber spatula. Reduce speed to low and gradually mix in flour mixture until just combined. Alternatively, stir in the flour mixture with a rubber spatula or a large metal spoon. Line a large plastic wrap (cling film) on the table counter. 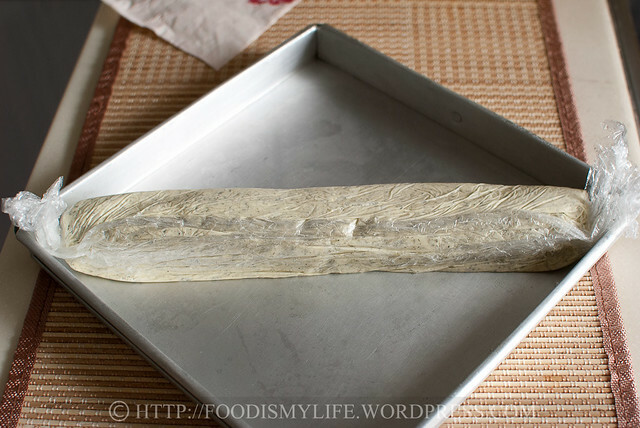 Transfer the dough onto the plastic wrap and shape into a log. Roll in the plastic wrap until it is about 1¼ inches in diameter (or 1¼ inches in length if making a square log). 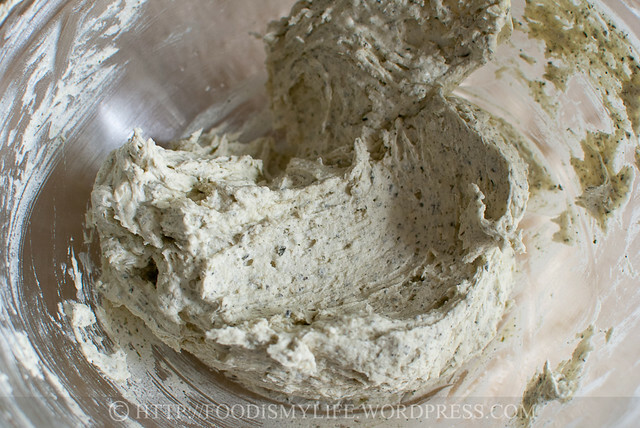 Freeze the dough until firm, at least 1 hour. Preheat oven to 175 degrees Celsius. Line a baking sheet with parchment paper. Unwrap the log and cut ¼ inch thick slices. Space them 1 inch apart on the baking sheet. Bake the cookies for 13 to 15 minutes, until the edges are golden. Let the cookies cool completely on the baking sheet on a wire rack. 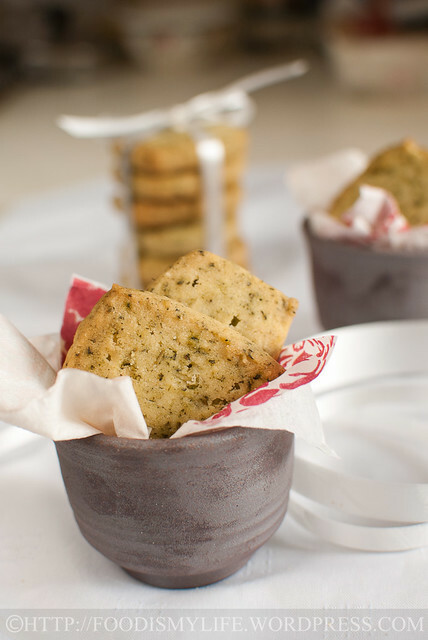 Store the cooled cookies in airtight containers at room temperature for up to 5 days. Serve with tea. wow thank you for this recipe!!! 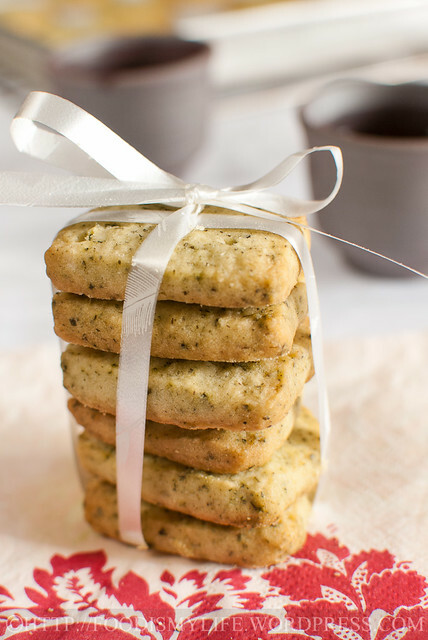 I was searching high and low for recipes to make these kinds of tea biscuits where it is not as sweet as traditional cookies and has the light fragrance of tea!!! This was easy to make and i had all the ingredients at home already!! Instead of using green tea, I opted for da hong pao oolong tea and it turned out great as well!! Thanks Janice, hope you will like it! I made a similar recipe using matcha powder (green tea that’s very finely ground) and it was certainly green but had a disappointing flavour, I think. Too much matcha at 2 tbsp. Yes Angeline, these are delicious and buttery cookies, but the green tea taste’s a bit too light for me, will increase the amount in the future! Thank you so much for the mention, I’m so honoured! Thank you Raymund! Oooh green tea ice cream’s delicious too! Awww I’m not that an expert Anuja, Google’s the one 😉 Thanks for liking it! Thank you Mich 🙂 Aww come right over! Thank you so much for the compliments, glad you like them! Thank you Joyce! Yes I really love the texture because it melts in my mouth! I have a pack of green tea powder and I keep telling myself to do something with it quick! And I never remember! Thanks for the reminder! Your cookies looks lovely, buttery cookies are my kinda cookies! how i like to bake something with tea leaves..many times i did not and then asked myself, do i like eating tea leaves? haha! but your post inspired me , i really shouldnt have doubt about that. Funny i was just commenting on someone’s blog earlier about edible flowers and now tea leaves 🙂 what lovely presentation of the cookies here! These look delicious & your pics are drool-worthy. Looking forward to cooking up a batch of these on the weekend. Thanks for the detailed explanation between green tea leaves and match powder, I am learning something new! The cookies like delicious, wish I could have some for tea right away! I really could have some of these cookies. They look perfect! love how the specks of green tea are dotted all over each and every cookie! Hail to the Green Tea expert!!! Great post and I love the flavour combination. Bookmarked!! 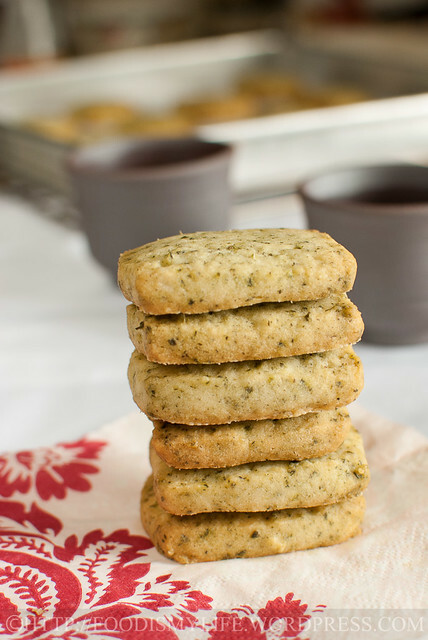 These green tea cookies are fantastic with REAL tea leaves. I always like green tea light taste. this cookies are something nice right? These look great! I have a lot of jasmine tea and this is a perfect way to some of it up! I’ll be trying out this recipe very soon! Mmm I got to tell you… I actually a few bites of the cookie dough! It was super buttery 😉 thanks for visiting! Thank you very much Bobbi, wish I can send some your way! Yes the weather has been so unbearable lately, I’ve melted God knows how many time! How’s the weather in Hong Kong?? Thank you Sibella! I can’t stop at one! Thank you very much Courtney, glad you like them! These are beautifully presented! They sound wonderful. Those look wonderful! I love tea flavor in cookies. And I’m not one of those folks who loves raw cookie dough, but I’d just love to have a spoonful of that! Another great recipe but, I have to say, the photography that accompanies your posts is always top-notch, making each a real pleasure to read. Today’s post is a case in point. Well done! Wow, they look fantastic and I bet they taste great too! An amazing looking cookie inspired by wanting to do something nice for a friend. I have a matcha powder/white chocolate chip tea cookie recipe that I’ve been wanting to make for ages and this definitely reminds me that I should get on it … soon. 🙂 By the way, I know how expensive matcha powder is. Such an interesting combination, they look totally yummy! Those look amazing! I love your photos! What a great idea. These look delicious and beautiful too!